Making a (Sweet Potato) Hash of Things | Good. Food. Stories. To make a hash of something is a mid-nineteenth century British phrase that means to mess something up, or ruin it. And nothing is more delicious than the ruination that can occur between potatoes and vegetables, especially when there is an egg involved in the mess. Hash gets its name from the French hacher, meaning “to chop”—a perfect description of the only skill you really need to have in order to make a delicious hash out of anything you have lurking around. So grab your friend who can hardly boil water, because tonight, she doesn’t have to. The greatest thing about hash is its absolute flexibility. Traditional hash involves meat and potatoes, but yours can include vegetables, herbs, cheese, and even fruit. It’s a meal that deliciously cleans out your refrigerator, using up ingredients that are about to go bad and the tiny bits of foods that might otherwise go to waste or make unsatisfying one-bite snacks. Have deli meat left from your lunch, but it isn’t enough to make a sandwich? Throw it in the hash! The bacon rescued from a partially-eaten BLT where the bread has gone all mushy? Throw it in the hash! Half an ear of corn that your kid didn’t finish and you can already tell will rot in its plastic bag until you clean it out next week? Throw it in the hash! Three baby carrots, two green beans, and the spinach that stuck to the bag taking up space in your veggie drawer? 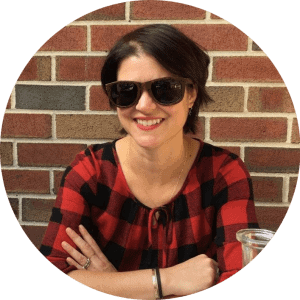 A chunk of sticky rice from your takeout three days ago? That one pickle bobbing in the huge jar? You know what I’m going to say. HASH THOSE MOFOS! As long as you add some potato and (in my humble opinion) some onion and garlic to the mix, anything you throw into a hash will end up tasting like … well, hash. Hash is endlessly forgiving and epically delicious, so do your worst. Whatever hash you make of things … it will still be wonderful. Because everything cooks together, you can make a large batch of hash for brunch and eat the leftovers for dinner, or vice versa. And the flavor profile of your hash can be changed by the addition of just one or two ingredients or spices. Give a plain potato and onion hash a Mexican spin by adding a can of black beans, melting in some cheddar cheese, and topping with salsa. Class up a hash of mixed veggies by adding chopped mushrooms and melty brie. Flavor a classic corned beef hash like a reuben sandwich by tossing in some sauerkraut and Russian dressing. While white or yellow potatoes are classic, my favorite base for a hash is the sweet potato. It pairs well with every flavor that white or yellow potatoes do, and its sweetness leaves the field open for some other additions. 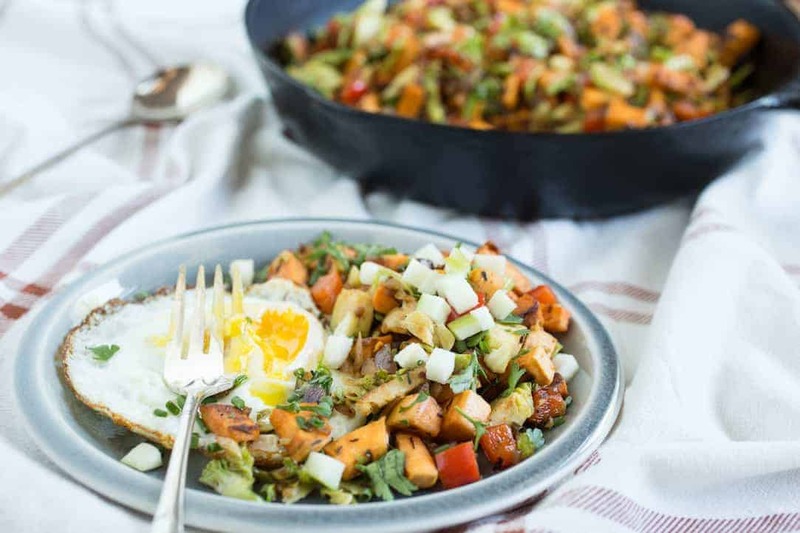 Turn a sweet potato hash a little sweeter by sprinkling potatoes with a little sugar and cinnamon, then crumble in bacon, and top with an egg for a sweet and savory brunch. Combine with sausage and chopped cabbage and apples this autumn. 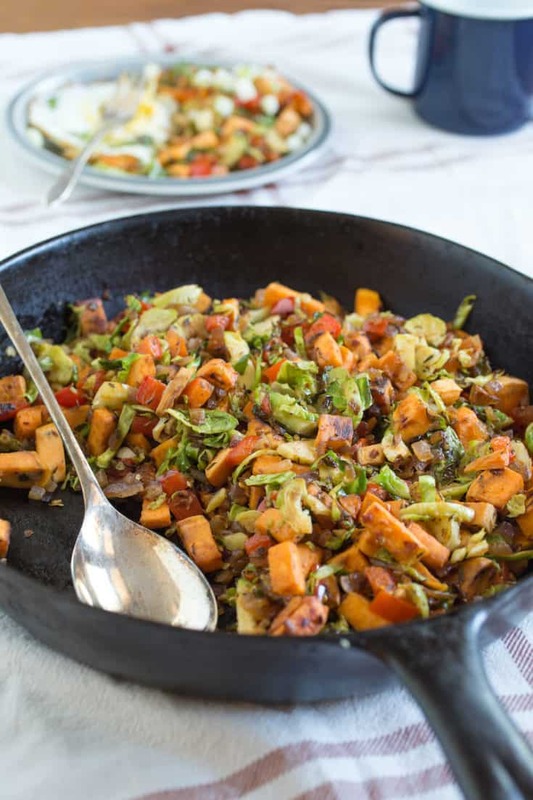 Heck, you could cook those sweet potatoes in sesame oil, and make a hash with bok choy, carrots, and scallions, topping it with a little sriracha and honey. 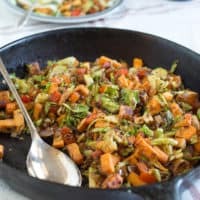 Hands down, my favorite sweet potato hash combines the sweetness of red bell pepper, the bite of onion, and the earthiness of brussels sprouts. It’s seasoned with thyme for depth and red chili for a little kick. And it’s topped with fried eggs so that when you cut the eggs the hash is blanketed in rich and creamy yolk. It’s one of my go-to dinners as summer turns to fall because it’s easy to throw together without heating up the whole kitchen, but the sweet potato and garlic put me in an autumn mood. Tonight, I’m finely chopping half of a leftover sweet red apple to sprinkle on top along with the parsley. So, you see, your kitchen’s the limit. 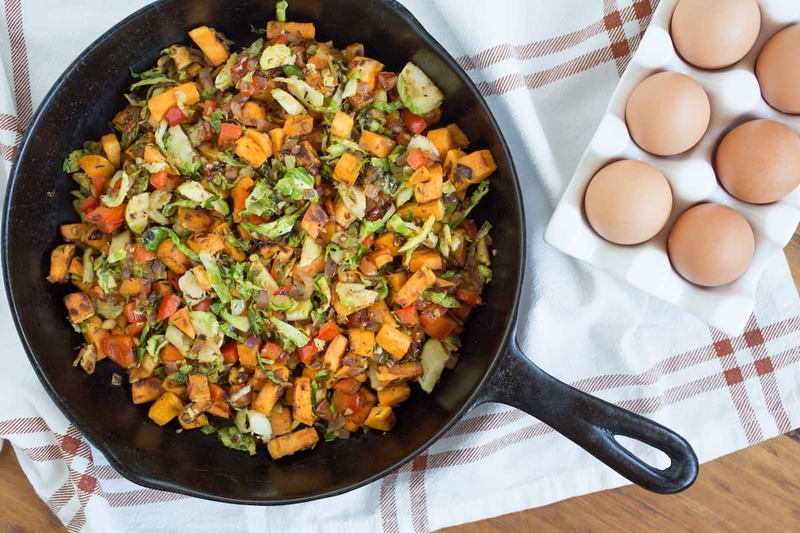 This sweet potato hash with Brussels sprouts is a complete meal for breakfast, lunch, or dinner—you can't go wrong any way you assemble it! Whisk the chili flakes, thyme, and paprika together in a small bowl. Set aside. Heat 1 tablespoon of your preferred fat in a large, heavy-bottomed skillet over medium-high heat. Add the cubed sweet potato and sprinkle with salt and pepper. Stir to coat, then spread the potatoes in a single layer in the pan. Cook for about 10 minutes until the potatoes are crisped at the edges—stir often enough that your potatoes don't stick to the pan, but allow them to sit still long enough to form a nice crust. If your potatoes are sticking, add another 1 tablespoon fat. Once the potatoes are crispy outside and soft inside, scrape into a bowl and set aside. Add another 1 tablespoon fat to the pan and stir in the onion, bell pepper, half the reserved spices, and another generous sprinkle of salt and pepper. Cook for 5-6 minutes in the same way you cooked the sweet potatoes, stirring occasionally so the onion and bell pepper have a chance to brown at the edges. Scrape the onion and pepper into the same bowl as the potatoes. Add 1 more tablespoon fat to the pan and add the garlic and Brussels sprouts, sprinkling once more with salt and pepper. Cook for about 5 minutes until tender, again following the same method, then return the potatoes, onion, and pepper to the pan. Add the remaining spices, taste to see if additional salt or pepper is needed, and cook for a minute or two more to marry the flavors together. Cook your eggs if you haven't done so already. Pile the hash onto a plate or into a bowl, sprinkle with chopped parsley, chives, and apple (if using), then top with eggs. Let the creamy yolks run into the hash, coating it and adding moisture. Leftover hash (without the eggs) will keep in the refrigerator for up to 3 days.